Smooth, fruity, creamy . 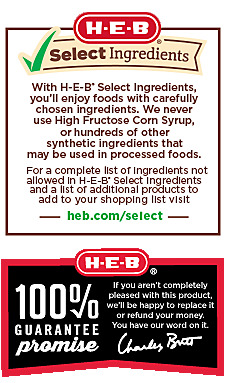 . . that’s how we describe our H-E-B Select Ingredients Strawberry Greek Yogurt! Boasting a succulent strawberry flavor, each cup contains 13 grams of protein and a cool 120 calories. Enjoy by itself or with your favorite nuts, coconut flakes, granola, and more. Keep refrigerated. Lot number and expiration date: on package. Ingredients Strained Yogurt (Cultured Pasteurized Fat Free Milk), Strawberry Preparation (Strawberries, Water, Crystalline Fructose, Sugar, Corn Starch, Pectin, Natural Flavor, Carob Bean Gum, Vegetable Juice Concentrate & Tomato Lycopene Extract [Color], Lemon Juice Concentrate). Made with Live and Active Cultures (S. Thermophilus, L. Bulgaricus, L. Acidophilus, Bifidus and L. Casei).